Radio Frequency Identification (RFID) is a non-contact, automatic identification technology that acts as the core technology for perception layer of the Internet of Things (IoT). It has a broad array of advantages including long-distance identification, batch identification, mobile identification, and data encryption, etc., and therefore finding wide application in industry, finance, logistics, warehousing, retailing, medical care, security, and other fields. As the IoT industry booms, the global RFID market has grown rapidly, with the market size exceeding USD10 billion in 2015. And this figure is expected to surpass USD17 billion in 2020. At present, the global RFID industry is mainly concentrated in European and American markets, where RFID technology has more mature applications, accounting for nearly 70% of the global total in 2015. In contrast, China is at the stage of RFID exploration and has no mature standards and technologies, thus leading to lower market penetration. In future, with improvements in RFID standards, technical breakthroughs, lower tag costs, as well as the advancement of smart IoT industry, the Chinese RFID market is expected to grow at an annual rate of around 20% in 2016-2020. The development of the RFID industry hinges on the consummation of the whole industry chain. As a link in the entire industry chain that produces the highest profit margin, RFID chips are mainly monopolized by foreign companies like Alien Technology, NXP, and Freescale. Currently, China has mastered HF RFID chip technology, but still has a bigger gap with foreign countries in UHF and higher-frequency RFID chips. In terms of RFID tags, China has become the world's largest production base, representing roughly over 70% of the world’s total. 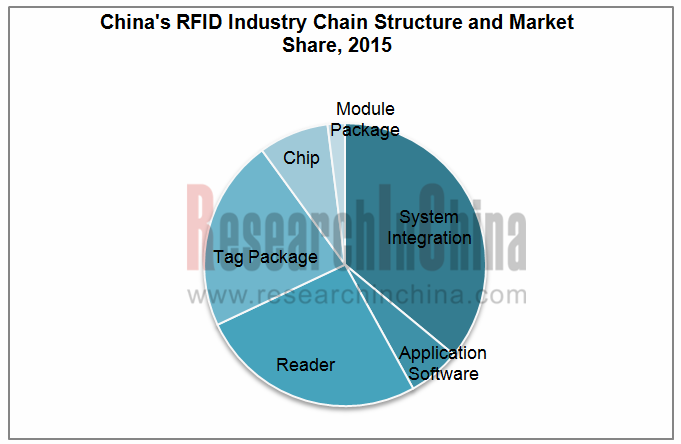 In 2015, China’s RFID market size approached RMB3 billion, 90% of which came from passive RFID. Comparatively, however, active RFID boasts long-distance identification, big data transmission, low transmitting power, and excellent reliability and compatibility, among others. Therefore, staring in 2004, active RFID market showed rapid growth, and a large number of enterprises such as Shanghai Super Ele&Tec, ZTE Intelligent IOT Technology, and Shenzhen Aerospace Innotechhave already entered the market. As for RFID readers, China has launched a series of products, and low-power read/write modules have been up to the level of foreign products of same kind. Moreover, China has made breakthroughs in high-power read-write modules and SoC. In future, RFID readers will develop towards mufti-function, multiple interfaces, modularization, miniaturization, as well as portable- and embedded-type. From the perspective of applications, the RFID technology in China has been applied in a broad range of fields from railway vehicle number identification, ID card and ticket management, animal identification, book management, to public transportation and production process management. But in logistics, clothing, medical care, food and other fields, it is still in its infancy, which results from the four reasons: first, higher costs; second, delay in establishment of national standards; next, high costs in infrastructure replacement; last, low technical level. In the future, RFID technology is expected to enjoy unprecedented development in food safety tracking, smart transportation, intelligent manufacturing, and clothing retailing in the wake of transformation and upgrading of traditional industries,. Operation, RFID Business, etc. of 10 global and 20 Chinese key companies.